This article summarizes selected California legislative and administrative actions during the year 2014, and highlights noteworthy developments in California case law. Assembly Bill ("AB") 2289 amended the California Franchise Investment Law (Corporations Code sections 31116 and 31121) to provide that, unless a stop order is issued, a franchise registration automatically becomes effective on the 3oth business day (as opposed to the 15th business day) after filing a complete application with the Department of Business Oversight ("DBO"), and similarly extended the time for the automatic effectiveness of a renewal application. AB 2289 defines a "complete application" as an application that contains the appropriate filing fee, a Franchise Disclosure Document, and all additional exhibits, including financial statements that conform to the regulations of the Commissioner of the DBO. The "complete application" provision was not previously required for franchisors to take advantage of the automatic effectiveness statute, thereby requiring the DBO to issue stop orders for incomplete applications. The bill eliminated the need for the DBO to issue stop orders for incomplete applications, and doubled the time in which the DBO can now issue orders approving or denying a complete franchise application. AB 2289 also amended Corporations Code section 31158 and Financial Code sections 12201, 17201, 22101, and 23305 to authorize the Commissioner to prescribe circumstances under which the DBO will accept electronic records and electronic signatures. The bill became effective on January 1, 2015. On September 16, 2014, the Franchise and Business Opportunity Project Group of the North American Securities Administrators Association, Inc. ("NASAA") issued a Multi-Unit Commentary ("Commentary") to provide guidance to practitioners for disclosing certain multi-unit franchising arrangements, which have become common in franchising but were not specifically addressed under NASAA's 2008 Franchise Registration and Disclosure Guidelines or the Federal Trade Commission's Franchise Rule. Previously, there were no specific prohibitions on a franchisor's disclosing several types of franchise arrangements in one disclosure document. For example, a franchisor could offer and disclose a prospective unit franchisee and prospective subfranchisor within the same disclosure document. The Commentary defines a "subfranchise arrangement" as an arrangement where a person is granted, for consideration paid to the franchisor, rights related to granting unit franchises to third parties, generally within a delineated geographic area. Similarly, a franchisor previously could use the same disclosure document for a unit franchisee and an area representative. The Commentary defines an "area representative" as a person that is granted, for consideration paid to the franchisor, the right to solicit or recruit third parties to enter into unit franchise agreements with the franchisor and/or to provide support services to third parties entering into unit franchise agreements with the franchisor. With the adoption of the Commentary, NASAA clarified that a franchisor may not offer both subfranchise rights and unit franchises in the same Franchise Disclosure Document, thereby necessitating a separate disclosure document for each type of arrangement. Similarly, a separate disclosure document is required for a franchisor offering area representative arrangements. The requirements of the Commentary became effective 180 days after its adoption (i.e., March 15, 2015), but if the franchisor or subfranchisor had an effective Franchise Disclosure Document as of the date of adoption, then the franch isor or subfranchisor must comply within 120 days after the franchisor's or subfranchisor's next fiscal year end. For existing franchisors with a calendar year-end fiscal year, that would require compliance with the Commentary on or before Apri 1 30, 2015. In a fairly unprecedented action, the National Labor Relations Board ("NLRB") Office of the General Counsel issued complaints against McDonald's franchisees and their franchisor, McDonald's USA, LLC ("McDonald 's"), on the theory that the franchisor was a joint employer of its franchisees' employees. The complaints, filed by the NRLB in December 2014, allege that McDonald's and certain of its franchisees violated the rights of employees working at McDonald's-franchised restaurants around the country who were engaged in activities to improve working conditions and wages. The NRLB alleged that McDonald's ahd its franchisees engaged in unlawful conduct, such as discriminatory discipline, reductions in hours, discharges, and other coercive conduct, in response to employees' attempts to unionize and other activity. As of the writing of this report, absent settlement, the initial litigation against the McDonald's chain was scheduled to start on March 30, 2015 , at six Regional Offices, including in Los Angeles. (6) provided training to drivers on job performance and customer interaction. These facts- evidencing FedEx's extensive right to control the manner in which its drivers performed their work- allowed the court to find the drivers to be employees, as a matter of law, under California's right to control test. The California Supreme Court found that Domino's was not vicariously liable for the alleged sexual harassment of its franchisee's employee. Under the franchise agreement, Domino's had no right or duty to control employment or personnel matters for the franchisee. The franchisee controlled employee training with respect to workplace behavior and sexual harassment by implementing its own sexual harassment policy and training programs for its employees. Also, the franchisee maintained authority to impose discipline for any violations of the sexual harassment policy. Under these facts, the Court concluded that no reasonable inference could be drawn that the franchisor retained the right of general control that an "employer" has over factors such as hiring, supervision, discipline, discharge, and day-to-day aspects of the workplace behavior of the franchisee's employees. A franchisor defeated claims brought by a customer of one of its franchisees that the franchised store failed to comply with the Americans with Disabilities Act and the California Disabled Persons Act. The district court found that the franchisor was not liable under these statutes, because it did not retain authority under the franchise agreement to dictate the physical layout of the store or otherwise participate in the alleged acts of discrimination against the plaintiff. In the absence of such evidence, the court found that the franchisor did not have control over the store such that it could ensure nondiscrimination against the disabled in violation of the law. A manufacturer was found not vicariously liable for the alleged injury caused by one of its service provider's employees, because the plaintiff presented no evidence that the employee was acting as an employee or agent of the manufacturer at the time of the accident. A California District Court refused to extend the control test used in Patterson v. Dominos Pizza, LLC, 60 Cal. 4th 474 (2014), to a "quasi-franchise relationship"- i. e., an independent operator relationship in which the parties expressly rejected a franchise relationship when evaluating the plaintiff independent operator's wage and hour claims against the defendant car rental company. A class representative's uncertainty about critical issues relating to text messaging called into question whether the representative gave his consent to the franchisor and franchisee's sending ofbulk spam text messages in violation of the Telephone Consumer Protection Act and related California statutes. Because of this uncertainty, the typicality element required for class certification was not satisfied. An employee wage and hour class action was remanded to state court, because the damage calculation used by the franchisor and several of its California franchisees to satisfy the $5,000,000.01 amount in controversy required by the Class Action Fairness Act was unreasonable. The court found the calculation unreasonable because it accounted for future damages for two years beyond the filing of the complaint, and assumed a 100% violation rate that was unreasonable and speculative. The ninth circuit rejected a franchisee's argument that an adverse arbitration award should be vacated because the arbitrator exceeded his powers. The arbitrator enforced certain provisions in the franchise agreement requiring the franchisee to assign its lease and property interests to the franchisor as part of the termination of the franchise relationship. The court found that the arbitrator's award was derived 'from the parties' agreement to arbitrate, which expressly provided for the assignment of the franchisee's lease and property interests to the franchisor following termination. A distributor was found to have waived its right to arbitrate a dispute with a manufacturer, because it pursued a lawsuit in federal court, which was inconsistent with the distributor's later attempt to arbitrate the dispute. The distributor knew of its right to arbitrate and acted inconsistently with that right, and the manufacturer was prejudiced by having to defend the claims in separate forums. The court also found that the issue of whether a party waived its right to arbitrate claims is an issue for the court to decide; to find differently would require the court to compel arbitration without reviewing the parties' contentions. A franchisee established by substantial evidence that a thirdparty successor corporation was the successor of the franchisor, allowing for an amendment to the judgment against the franchisor to add the successor corporation as a judgment debtor. A franchisor's attempt to enforce an out-of-state forum selection clause in a master franchise agreement failed because the forum selection clause was contrary to California's strong public policy against venue provisions that require California franchisees to litigate disputes outside of California. The U.S. Supreme Court's landmark decision in Atlantic Marine Constr. Co., In c. v. United States Dist. Court for W. Dist. of Texas, 134 S. Ct. 568 (2013), was found by the court to be "inapplicable," as the Atlantic Marine analysis "presupposes a contractually valid forum-selection clause," and the forum selection clause at issue in this case was rendered invalid by the California Franchise Relations Act. An automobile manufacturer's delayed exercise of a contractual right of first refusal to purchase an existing dealer's distributorship did not support a claim for intentional interference with prospective economic advantage, even though the prospective purchaser incurred avoidable expenses as a result of the manufacturer's delay in exercising its first refusal rights. Despite this ruling, the manufacturer was required under California Vehicle Code section 11713.3(t)(6) to reimburse the prospective purchaser for expenses it incurred in "evaluating and negotiating the proposed transfer." An automotive dealer had no claim for concealment, because it could not show that a manufacturer had a duty- i.e., a "fiduciary, confidential, or other special relationship"- to disclose a pending market study prior to the dealer's purchase of the dealership and signing the dealership agreement. A disappointed beer distributor transferee was not permitted to rely on Business and Professions Code section 25000.9- providing for damages against beer manufacturers who unreasonably withhold consent for the transfer of beer distributorships- because the statute was designed to protect disappointed transferors, not transferees. The court held that unreasonably withholding consent could not serve as the independently wrongful act needed to establish a cause of action against the manufacturer for interference with prospective economic advantage. 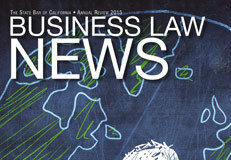 Last year marked a number of key developments in franchise law in California, including a willingness by certain courts and government agencies to characterize, depending upon the level of control, franchisors as joint employers of their franchisees' employees, continued enforcement of contractual alternative dispute resolutions, and new government regulation concerning the automatic effectiveness of franchise registrations.